deposits, savings bank deposits, current deposits and other accounts along with bills payable. It is seen from the above graph that fixed deposit is in the highest percentage in aspect of comprising the deposit mix- almost 40 percent- in the year of 2008. Savings bank deposits and term deposits are in almost similar position in case of comprising the deposit mix where 22 percent of the total deposits comes from savings bank deposits and 21 percent from term deposits. Current deposits and other accounts comprise almost 15 percent- a noteworthy amount in a sense- of the deposit mix and bills payable has a contribution- though comparatively much lower than those of other deposits- of exactly 2 percent in the total deposit mix. 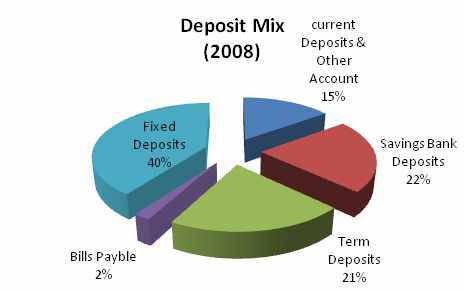 It is seen from this graph that fixed deposit is in the highest percentage in aspect of comprising the deposit mix- almost 41 percent- in the year of 2009, that is, it experienced a slight increase of 1 percent over the previous year. Savings bank deposits and term deposits are in almost similar position in case of comprising the deposit mix where 21 percent of the total deposits comes from savings bank deposits and 22 percent from term deposits, that is, the position of savings bank deposits and term deposits were exchanged just in the year 2009. Current deposits and other accounts comprise almost 14 percent- a slight decrease of 1 percent over the last year in the contribution- of the deposit mix and bills payable has a contribution- though comparatively much lower than those of other deposits- of exactly 2 percent in the total deposit mix which remained unchanged. The deposit base of the bank registered a growth of 25.51 percent in the year 2008 over the previous year and stood at Tk.60,187.89 million. Expansion of branch network, competitive interest rate and innovative deposit products contributed to the growth. The customers of the bank were individuals, corporations, financial institutions, government and autonomous bodies etc. The deposit base of the bank registered a growth of 27.66 percent in the year 2009 over the previous year and stood at Tk.76,838.64 million. It is also seen that the bank’s deposits are increasing year by year. So it can be said that National Bank Ltd. is maintaining consistency in maximizing its deposits. Total liabilities increased by 27.19 percent to Tk.66,086.60 million as of December 31, 2008. This was mainly due to increase in customers’ deposits and keeping provision for income tax, gratuity and loan loss etc. Total liabilities increased by 25.86 percent to Tk.83,168.02 million as of December 31, 2009.
deposits and other accounts. 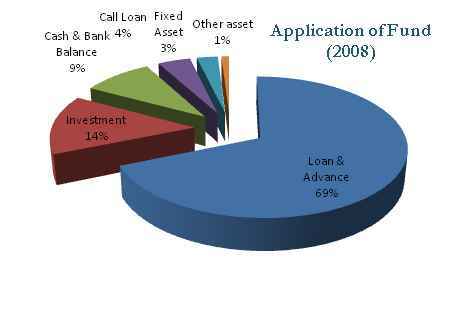 It is seen from the above graph that deposits and other accounts is in the highest percentage in aspect of comprising the sources of fund- almost 84 percent- in the year of 2008. Reserve and surplus and other liabilities are in almost near position in case of comprising the fund mix where 5.89 percent of the total deposits comes from reserve and surplus and 6.42 percent from other liabilities. Paid-up capital comprises 2.59 percent of the total fund and one of the momentous facts of fund collection by conventional banks- borrowings- has a contribution- though comparatively much lower than those of other deposits- of almost 1.74 percent in the total collected fund. So, deposit is comprising the lion share of fund collection by this conventional bank. Paid-up capital comprises 3.09 percent of the total fund and one of the momentous facts of fund collection by conventional banks- borrowings- has a contribution- though comparatively much lower than those of other deposits- of almost 1.68 percent in the total collected fund. Deposits and other accounts, paid-up capital, reserve and surplus increased slightly in the year of 2009 over the last year and only borrowings and other liabilities decreased slightly in the year of 2009 over the last year and this evinces a good financial growth. made it an indispensable way of business in every economic system. Limited access to financing SME is still form the crux the problem. In case of NBL, SME financing was one of the key drivers in credit expansion. NBL underscores the importance of this financing in terms of national outlook. In this respect, institutional strengthening measures were undertaken by developing sound human resources base to enable SME financing through a large network of 106 dispersed delivery channels of the bank. Development and support to entrepreneurs in various fields of trade and industry received a major attention and thrust from NBL. Future challenges in this area are identified and appropriate action plans are rolled on. Total outstanding credit in the SME sector stood at Tk.8253 million in 2009 against Tk.6390 million of 2008 indicating 29.15 percent growth. 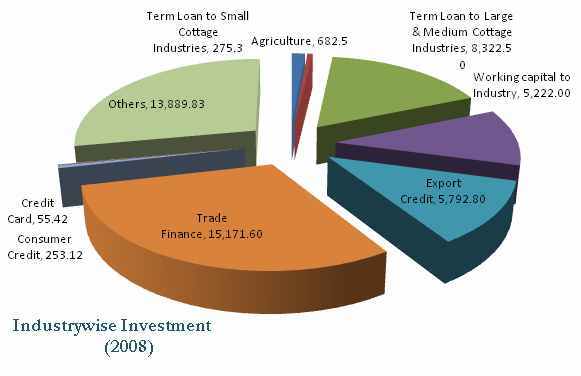 Bank’s portfolio in the SME sector is composed of 12.69 percent to total loan outstanding in 2009. National Bank Limited has been playing an effective role in capital market alongside traditional banking. Long before, the bank remained engaged with merchant banking through IPO activities viz. banker to the issue, underwriting, pre-placement etc. Total investment of the bank in the capital market as on 31 december 2008 was Tk.2346.9 million consisting of primary and secondary market for Tk.227 million and Tk.2119.9 million respectively. 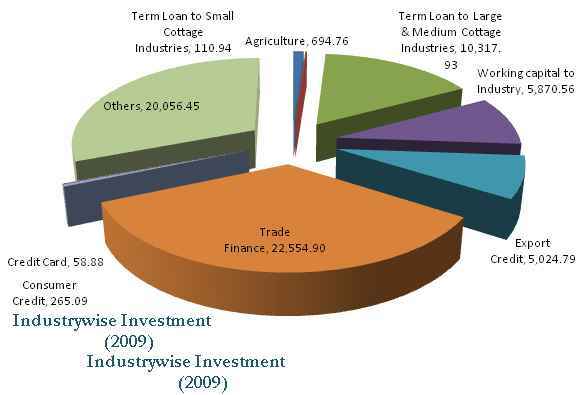 As at 31 December 2009 bank’s investment in capital market grew by 52.96 percent to Tk.3244.85 million. The bank bagged Tk.503.98 million from secondary market and Tk.71.89 million as cash dividend registering a growth of 351.96 percent and 62.96 percent respectively over the previous year. As it has been demonstrated by graphs of industry wise investments that a huge portion of investment by this conventional bank is trade financing, here it is necessary to focus on it. As in the previous years, national Bank Limited was keenly active in international trade, mobilization of wage-earners remittances from abroad. Besides, the bank expanded its external business by undertaking export bill negotiations, realization of export proceeds etc. From the above graph it is seen that amount of total investment by National Bank is increasing consistently with the passage of time and the years 2008 and 2009- under consideration- show that it had amount of Tk.10162.81 million and Tk.12315.20 million respectively. National Bank Limited designed appropriate credit risk management criteria and strategies for balanced lending mix commensurate with sound capacity to finance in the short-term and long-term credit. NBL succeeded to increase its loans and advances despite the current wave of global recession registering a growth of 36.16 percent with a total loans and advances portfolio of Tk.50665.07 million in 2004 compared to Tk.36475.7 million of 2007. Despite of slower growth in business during 2009 due to global crisis significant improvement has made in second half of the year. Loans and advances grew by 28.55 percent and stood at Tk.65129.99 million in 2009 compared to Tk.50,665.07 million of 2008. The growth was due to injecting significant amount of fund in new ventures of syndicated loan, project loan, lease finance, SME, agri loan, and usual growth in foreign trade. It is also seen that the bank’s loans and advances are increasing year by year. So it can be said that National Bank Ltd. is maintaining consistency in maximizing its loans and advances- one of the momentous aspects of investment as a conventional bank.. 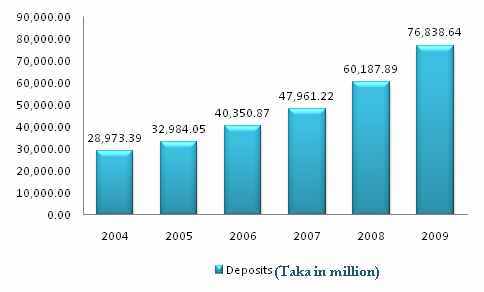 The total assets of the bank grew up by 27.75 percent to Tk.72212.80 million in 2008. The significant increase in assets was achieved due to rise in loans and advance, investments, money at call and short notice, cash and other balances with other banks and financial institutions. The total assets of the bank grew up by 27.53 percent to Tk.92084.79 million in 2009, that is, the growth rate decreased- though to a very slight extent- in this year compared to the previous year. In case of application of fund in 2008 the highest portion of fund goes for loans and advances while investment is in the second position. 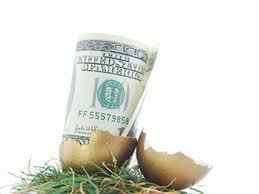 Cash and cash balance has a percentage of 9.14 percent while 4.28 percent fund is applied in call loan. A very minimum application of fund is seen in aspect of fixed and other assets bearing 2.74 and 0.99 percent respectively. In case of application of fund in 2009 the highest portion of fund goes for loans- increased by 2 percent while compared to the previous year- and advances while investment is in the second position. Cash and cash balance has a percentage of almost 10 percent while a deduced rate -compared to the preceding year- around 2 percent fund is applied in call loan. A very minimum application of fund is seen in aspect of fixed and other assets bearing 2 percent for both, that is, application of fund in company’s assets is increased – though to a very slight extent- in the year 2009 compared to the previous year.